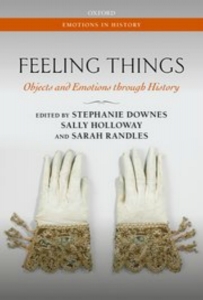 In Feeling Things: Objects and Emotions through History, editors Stephanie Downes, Sally Holloway and Sarah Randles bring together contributors to explore how people have both shaped and been shaped by objects throughout history, with a particular focus on the European medieval and early modern periods. The engaging and fascinating chapters that make up the volume offer a worthy contribution to the study of material cultures that will resonate with scholars working across different eras and disciplines, writes Lexi Earl. Feeling Things: Objects and Emotions through History. Stephanie Downes, Sally Holloway and Sarah Randles (eds). Oxford University Press. 2018. We all encounter objects in our everyday lives. Most we pass by, without thought of how we affect the object or how it might be affecting us, our lives or the people that surround us. Some we remember – ‘portable emotional paraphernalia through which we define aspects of ourselves’ (229). Maybe these are the shoes of a first child, a prefect’s badge from school, a postcard or a letter, a ring. These objects make up our material cultures. We are shaped by the objects that are significant to us, and we also shape these objects. This dual experience of shaping and being shaped by objects has occurred throughout history. In Feeling Things: Objects and Emotions through History, editors Stephanie Downes, Sally Holloway and Sarah Randles have brought together historians focused on objects and emotions through the medieval and early modern periods in Europe. The edited collection is divided into three parts: ‘Potent Things’; ‘Binding Things’; and ‘Moving Things’. Each is made up of a number of different chapters, all gathered together through the central theme: objects with (perceived) supernatural powers, like saint’s relics or shoes; objects which require engagement, like letters or books; and objects which transcend time and space. As the editors point out in Chapter One, historians have paid attention to the way people ‘feel for or because of objects’ (9, emphasis in original), but have been less likely to think about the way objects are changed or shaped by people. This volume therefore goes some way to fill this gap. these things – these ostensibly lifeless things – through a rich associate network become active actors in the theatre of their beholders’ affective existence: they unsettle, ignite, disturb (30). The chapter focuses on the way the bodies of saints, objects associated with them or even objects that have had contact with a saint can become part of this ‘associate network’ and thus engender a particular kind of response from their viewer. Gertsman unpacks each element of her chosen reliquary – a tooth, silver, copper and crystal – exploring in turn how each contains a number of signs that can be read by a knowledgeable viewer. As Gertsman argues, it is impossible to know exactly how people perceive(d) the reliquary, but we can improve our understanding of what these emotional responses might have been through paying attention to ‘stories, images and things’ (42). Hilary Davidson’s chapter, ‘Holding the Sole: Shoes, Emotions, and the Supernatural’, captured my attention and imagination immediately. Davidson focuses on the myths, superstitions and magical tales surrounding various shoes and thus different cultures of belief in magic and the supernatural. She examines shoes in fairy tales, the shoes of saints and, most fascinating for me personally, the tradition of concealing shoes in ‘a void space in a building, usually between floors, under doorsteps, or around a chimney’ (88). Reasons for the concealment remain unclear, but researchers suspect it was either to ward off bad luck or to bring good fortune. Davidson debates whether the presence of iron nails in shoes was thought to help keep spiritual beings like faeries or witches at bay, as iron is one of the oldest superstitious protections against such beings. Often, when shoes are found through renovations, the shoes are left where they are as though the current owners of the property do not want to disturb whatever magical quality the shoe is providing to the building. Shoes, Davidson argues, hold their shape and thus their connection to the person that wore them. It is this that ‘focuses footwear within a distinct set of belief-bound practices, and vehicles to amplify the supernatural’ (91). In Part Three of the volume, the contributors concentrate on objects and movement, exploring how objects transcend time and space. Alicia Marchant’s chapter charts the affective history of the Stone of Scone: a stone kept at Edinburgh Castle over which monarchs of the United Kingdom are crowned. Marchant draws our attention to how this stone has been drawn into contests over national identity, how it pulls on our emotions and contributes to ‘political memories and ideologies of two neighbouring nations’. It is, after all, just a stone. How, then, does it manage to evoke all these different reactions? Marchant’s chapter explains the stone’s role in Scottish and English history and political ideology. The stone is a maker of kings and queens: it was believed to be affected with an extraordinary power that can determine monarchs and thus political rulers. ‘The king is placed upon it, and through this physical association with the stone the monarch becomes a monarch’ (200). As Marchant argues, the power of the stone lies in its myth and legend, its unknown origins (was it really the pillow on which the biblical figure of Jacob rested his head?) and its human-designated links to power and ritual (199). The stone is an ‘actant’ (207): it has shaped the nations of England and Scotland, their people and their political leaders as much as it has been shaped by them, including through some physical alterations (some purposeful, some not). This chapter on the stone illustrates most effectively the dual nature of our relationship with objects, the emotions objects can provoke or invoke within us and the place objects have in our lives. The chapters in this collection are engaging and fascinating. Although all the objects examined are from the medieval or early modern period, the arguments the authors make regarding the way objects can affect our lives, and the way our lives affect objects, resonate with other time periods and disciplines. As Joanne Begiato argues in the Afterword: ‘emotional autobiographies can be written to great effect not just about individuals, but also about families, communities, and nations, to offer insights into societies across time and place’ (230). Understanding a community’s use of or beliefs around an object can help researchers understand the community more fully. I therefore agree with Begiato in her call to explore ‘more ephemeral or transitory’ (233) objects that evoke emotions – food, perfumes and smells, music. Such explorations would make a worthy contribution to the research of material culture, whether focused on a historical time period or on the current day. Lexi Earl is a writer and baker, currently based at the University of Nottingham. She is particularly interested in food cultures and foodways, how people come to learn about food, and the ways food is taught in schools. She is the author of Schools and Food Education in the 21st Century (Routledge, 2018).